The Dataplex 3G M2M Router (DPX-560) offers an easily integrated solution that is simple to manage, configure and customise. Designed to enable diverse M2M applications, the DPX-560 connects to 3G networks, comes equipped with GPS and multipurpose interfaces including I/O, Serial and Ethernet (USB is optional). TTL option is also available, where the modem uses up to two TTL interfaces to communicate to TTL aware devices. 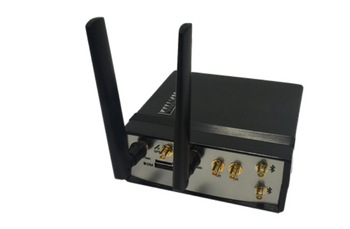 This robust and intelligent Dataplex 3G M2M Router provides real-time M2M data connectivity, even in harsh environments. The DPX-560 creates reliable point-to-point or point-to-multi-point WAN connections for a variety of mission critical applications such as primary broadband, video surveillance, retail, payments, in-vehicle communications and industrial automation. The unit will connect and manage remote asset where the DPX-560 will deliver speeds reaching 14.4Mbps over 3G networks; and feature Ethernet, Serial (RS232/422/485) and USB (optional) 2.0 ports to seamlessly connect virtually any piece of equipment, anywhere. The DPX-560 can be used to track and monitor vehicles and other mobile assets from any location using built-in GPS; and can gather information about the physical environment using the three multipurpose I/O ports to collect data from sensors and monitor also from other input devices. One I/O port is a dedicated ignition input that can power the router when a vehicle is started, providing powering flexibility. DPX-560 deployment in remote locations can be managed from a central location in real time to reduce site visits and manual maintenance costs. Technicians can receive status alerts, log into the system, extract and analyse data, upload firmware and change configuration from virtually any location using management interfaces including OMA LWM2M, TR-069, SNMP, HTTP/HTTPS, Telnet/CLI, and SMS. SMS can be used to access, control and monitor the router, and send and receive text messages while protecting from 3G/2G IP network outages using GSM networks.